Another fascinating article in the ever-growing body of knowledge about the way our brain works appeared in The New York Times this week. The Journal Nature reported the results of a study which begins to answer this question. 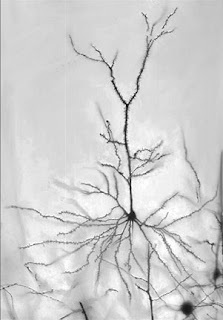 The NY Times article states: Researchers at the Howard Hughes Medical Institute in Maryland stimulated not a single cell but a single dendritic spine, one of the hairlike growths that sprout from a cell’s branching arms. Neuroscientists had theorized that this effect, called clustered plasticity, might help account for the tremendous capacity of the brain, but they had not seen it in action. Read more. Click here for earlier posts about the brain.